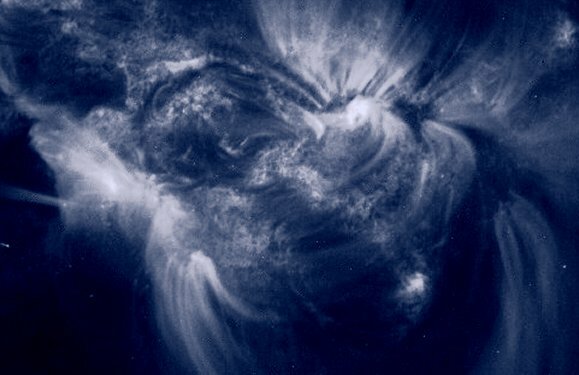 Opis: Discovered in recent close-up pictures of the Sun from NASA's Transition Region And Coronal Explorer (TRACE) spacecraft, this spongy-looking stuff has a temperature of 2 million degrees Fahrenheit ... and has been dubbed "Solar Moss". The false-color TRACE image above was recorded in extreme ultraviolet light on October 18. It shows the solar moss associated with hot magnetic plasma loops arching above one of the Sun's active regions. The moss is the dark blue and white fluff that seems to cover areas between the bright white bases of the loops. Solar moss has been seen to spread, typically persisting for tens of hours, and may form rapidly following a solar flare. Solar moss isn't found growing only on the Sun's north side, but as a rule seems to lie above the photosphere or visible surface, in the transition region of the solar atmosphere. Complex and previously unknown, this feature may provide a clue to the long sought mystery mechanism responsible for heating the Sun's outer atmosphere.